essential during the music's golden era. soundsystem operators, and a handful of soundsystem deejays. with his help, like Freddie McGregor, Eek-A-Mouse, and [the engineer] Scientist." Starlight, managed to find major label distribution (through Mango/Island in 1988). productions were very popular in London and his catalog can be found primarily on U.K.
Brooklyn-based Clocktower Records released much of his work. hit songs that I made, and I produced other artists as well." briefly for the legendary Augustus Pablo and his Rockers label and for Stamma Hobson. height of the era of militant, Pan-Africanist lyrics and Rastafarian consciousness. 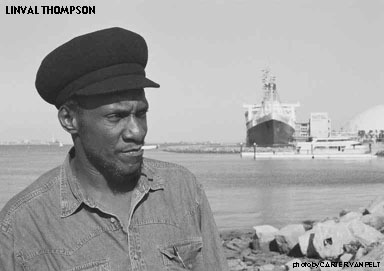 Thompson was the quintessential roots reggae vocalist. the militancy and Pan-Africanism of the rockers era. rhythms and the final mixes by Scientist at King Tubby's studio. Mouse (Skidip & Mouse and Man), Johnny Osbourne (Nightfall), and the Wailing Souls (Wailing). Brown, Delroy Wilson, and Freddie McKaye. towards carnal themes, eschewing the radicalism of the 70s. of land he purchased with his first album advance. in the 90s, including King Jammy. Dread in 1997, a collection of 17 tracks by various artists from the 70s and 80s. Other recent releases include the Easy Star Records set, Can't Stop Us Now: Linval Thompson & Friends. late 70s and early 80s. where many regarded his 50 minute performance as the best of the festival. now because I choose to, and because I love it."